Red and black silk satin; floral embroidery of metal beads; buttoned straps. 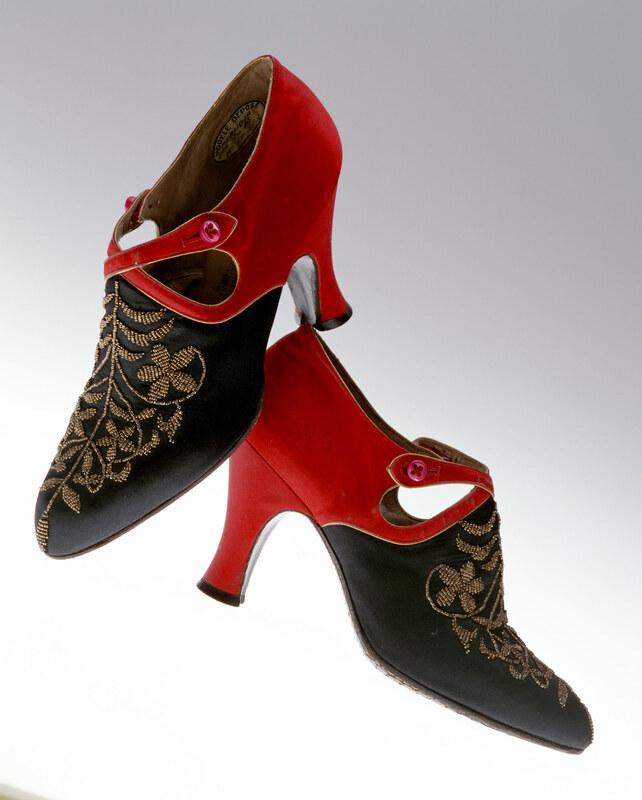 These high-heeled pumps possess a vivid contrast of red and black, as well as a decorated strap that was popular in the 1920s. Skirt-length rose up to the knee and shoes played an important role in the fashion of the time. Because of this trend, shoe designers who functioned differently from conventional shoe craftsmen became active. André Perugia gained his fame making shoe designs for Paul Poiret, and he became known as one of the most talented shoe designers in the first half of the 20th century. His detailed designs, rooted in the shoemaking craft and the engineering knowledge cultivated by the military, were highly valued. In the 1930s, Perugia created shoes for Elsa Schiaparelli that were quite surrealistic.